OAKLAND, Calif. — A study of real-world exposure to non-ionizing radiation from magnetic fields in pregnant women found a significantly higher rate of miscarriage, providing new evidence regarding their potential health risks. The Kaiser Permanente study was published today in the journal Scientific Reports (Nature Publishing Group). Despite — and especially since — being namechecked by President Trump as part of the reasoning for exiting the Paris Agreement, Pittsburgh has been vocal in its commitment to climate action and green energy. “The story of Pittsburgh’s resurgence really began around the need to reduce pollution and improve our air quality,” said Chief Resilience Officer Grant Ervin in a 2017 interview with Smart Cities Dive. That need included revitalizing former industrial sites with green spaces, reducing pollution from the city’s coal and steel operations and prioritizing alternative transportation. The plan also built on strong public support; the city council voted 8-0 to approve the climate goals, with one abstention. City leaders had more than 100 workshops and public events over the last three years to gather input on the plan, with representatives of more than 90 organizations, businesses, nonprofits and government agencies involved. The interest in public-private partnerships can help ensure the goals don’t just stay on the page and actually become reality. As the federal government steps back on climate action, states and cities have begun filling the gap, setting ambitious emissions reduction goals and commitments to clean energy. The We Are Still In coalition has some 200 mayors vowing to keep up the goals of the Paris climate accord, and last month launched the We Are Taking Action initiative to push local climate action. While city leaders have a lot of leeway in implementing direct changes in their area and represent a broad swath of the country, it remains to be seen if those efforts can make up for any pollution reduction being lost from the federal level. Does 112% growth in 2017 mean community solar has finally solved its complexity problem? Solar developers and utilities are moving into the sector fast, writing new rules as they go. Utilities like big solar projects that they can own, and consumers like rooftop solar that they can own, but there is a third kind of solar emerging that may finally be ready to work for both utilities and consumers. Community solar projects are interconnected with utilities’ distribution systems in ways that give utilities the same control they get with larger projects. But they are owned or leased by individual customers like rooftop solar. And they are big enough to get economies of scale that make them more affordable than rooftop solar. Community solar has been held back by the complexities that come with being the right choice for everybody. But recent growth shows it may have begun to resolve those complexities. The appeal is clear. Community solar’s installed U.S. capacity grew 112%, from 387 MW at the end of 2016 to 734 MW at the end of 2017, according to a report released May 1 from the Smart Electric Power Alliance (SEPA) and the Coalition for Community Solar Access (CCSA). This includes utility-administered projects in 33 states and private developer-administered projects in 19 states. The potential market is huge as it includes all electricity customers without solar-suitable roofs or the financial status or inclination to contract for or own it. The National Renewable Energy Laboratory in 2015 estimated the potential market at between 32% to 49% of the projected 2020 overall 5.5 GW to 11 GW distributed solar market, representing between $8.2 billion and $16.3 billion in cumulative investment. Community solar’s rapid recent growth shows that potential can become real. Utilities are beginning to understand its system benefits. Financial backers are starting to appreciate its value. And SEPA and CCSA are beginning to standardize policy and make the new concept more familiar to customers. The industry has begun to provide solutions for community solar’s complications. Financial backers and utility regulators have sometimes been reluctant to commit to projects dependent on subscribers. Consumers have been reluctant to buy portions of promised projects with less than familiar contractual obligations. To resolve consumers’ uncertainties, community solar advocates created legal and transactional frameworks that led to a state policy matrix, a state policy template, and utility best practices. Pioneering laws in Colorado, Minnesota and Massachusetts led to 2017’s explosion of activity by private sector developers while utilities continue to refine their offerings. SEPA Manager and report co-author Dan Chwastyk said there are now at least 228 utilities with community solar offerings. “That is almost 10% of U.S. utilities, which is a significant penetration since it is a new concept to them,” he told Utility Dive. By the end of 2017, the 228 utilities with offerings broke down as follows: 160 cooperative utilities, 37 public power utilities and 31 investor-owned utilities. Only 30% of these programs had a capacity of over 1 MW. But only 20% of programs had a capacity of over 1 MW in 2015. The key selling point for community solar is that it increases access, the new SEPA-CCSA paper acknowledges. But it also can offer the cost, reliability, economic, utility-system, climate, health, jobs, and flexibility benefits of other distributed and utility-scale renewables. And “some utilities are starting to explore how community solar can aid grid reliability and other ancillary services,” the report adds. CCSA Executive Director Jeff Cramer acknowledged that community solar is still a small percentage of overall and new capacities. “But it is the fastest growing sector of the solar industry,” he told Utility Dive. There are state policies that shape community solar and facilitate private developer participation in 17 states and the District of Columbia, the paper reports. Legislation in at least nine states would add or expand policies. State policy supports growth but does not guarantee growth because some state policies are poorly designed, the report adds. Community solar’s 112% capacity growth in 2017 was preceded by “an average annual growth rate of 68% over the last 10 years,” the SEPA paper notes. Both Cramer and SEPA’s Chwastyk estimated that over 250 MW have been added this year and, by May 1, the sector’s cumulative installed capacity had reached 1 GW. Continued growth in the near term will be driven by “declining solar costs, increasing customer awareness of the business model, and the opening of new state markets by policy,” the paper reports. The only real limiting factor in the near term is the availability of state policy to support private sector developers because “community solar grows in states that have favorable policy,” SEPA’s Chwastyk said. But as of now, community solar projects are 83% subscribed. Programs administered by utilities and private developers have comparable subscription levels, despite differing priorities. The experience of Poudre Valley Rural Electric Association (PVREA) demonstrates those differences. PVREA, in northern Colorado, sold out its 116 kW community solar array in 2012 and its 632 kW array in 2015. It brought a 1,500 kW community solar array on line last year that is “about 50% subscribed,” according to Member Relations Manager David White. Two-thirds of the new array is allotted to low-to-moderate income, non-profit and public service customers. The other third is for residential customers and offers a value proposition comparable to that from rooftop solar, White told Utility Dive. PVREA is using the array’s unsubscribed portions as utility generation while it markets the offerings. This reveals utility considerations that differ from private developer considerations. Private providers are driven by market factors, while utilities are obligated to serve all customers. It benefits utilities to have an offering that will attract customers considering moving to rooftop solar. And utilities can use unsubscribed output to serve load. Hunt agreed these are important differentiations. “Third parties must have projects subscribed or they don’t get paid and their financiers don’t get paid,” he said. “That natural market mechanism makes the projects work.” An example is the Clean Energy Collective’s 21 MW project for South Carolina Electric and Gas. Though not yet interconnected, it is already oversubscribed, he said. Despite the growth in community solar, costs are already something of an obstacle, according to the SEPA-CCSA report. Administrative costs, which include customer acquisition and customer billing and crediting costs, are $0.12/watt for projects of less than 1 MW. They fall to $0.09/watt for projects bigger than 1 MW, which are more often built by private sector developers. To address the complexities of customer acquisition and customer billing and credit handling that drive costs, SEPA obtained a grant from the U.S. Department of Energy Solar Energy Technologies Office. Using extensive industry feedback, Chwastyk led efforts that resulted in the “Decision Tree” detailed in the new report. Over half of utilities told SEPA their biggest challenge is customer acquisition. By contrast, private developers “overwhelmingly indicated that working to meet complex and diverse policy requirements is their major challenge,” the paper reports. The first question is whether the utility or a private sector developer will be the program administrator or whether responsibilities will be shared. The next decision is whether the customers will have an up-front payment or an ongoing monthly payment. Some programs are moving toward offering customers both options. The third decision is whether or how to limit participation. Subscriptions can be open to residential and commercial electricity users or can be strategically apportioned among various customer classes, including low income and non-profit customers. Finally, decisions must determine the “key terms and conditions” of the subscription, including how long a customer is required to participate and how long the program administrator guarantees the terms of the subscription. The approach is already working for utilities. A July 2016 Entergy Mississippi community solar proposal filed with state regulators references extensive SEPA guidance on program design choices. Chwastyk said the Decision Tree revealed two crucial takeaways. First, “implementing it is almost worthless if the market research has not been done, because so much of the design should be defined by who the program is being marketed to and what they want,” he said. Utilities, and especially investor-owned utilities, are concerned that regulators and policymakers will undermine their efforts with overly rigid or prescriptive requirements, she said. Instead, utilities should be encouraged to develop a “portfolio” of projects with a full range of offerings for all customer classes. The Council is considering an historic plan to require our local utility to obtain 100% of its electricity from renewable sources by 2050, including 17% from solar power (up from the current standard of 50% renewables by 2032 with 5% from solar). While there’s still a lot of work to do, this bill is a great start for securing D.C.’s renewable energy future. And with your help we can fight to make that future equitable and inclusive. What will tripling solar generation mean for the city? To meet the 17% solar carve-out, the District will need to generate hundreds more MW of solar electricity. That translates to lower and more predictable electric utility bills, thousands of new jobs, tens of millions of dollars in additional economic activity, and massive solar-related cost savings from improved grid resiliency. 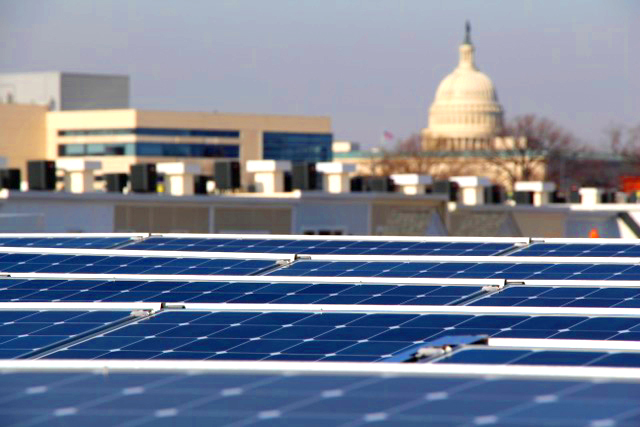 Solar United Neighbors supports the bill, but we also think it should be improved by including funding important for energy equity programs like “Solar for All” so that all D.C.’s residents, particularly lower income families, can benefit directly from solar. Please contact the Council now to voice your support for the “One Hundred Percent Renewable Portfolio Standard Expansion Amendment Act of 2018.” Tell them you want them to modify the bill to ensure that all residents have the opportunity to go solar, and that you’re proud that our city is building a clean energy economy for all. wo evolutions are taking place around the power sector today, which could make it more difficult to defend from a growing cyber threat. Hackers are becoming increasingly sophisticated in their attempts to disrupt electric grids. Attacks are more targeted, including spear phishing efforts aimed at individuals, and are shifting from corporate networks to include industrial control systems. At the same time, the grid is becoming increasingly distributed and connected. Older power plants have been spared cyber attacks because they were not connected to the internet (which may not have existed when they were built). New resources are connected — though they are also being constructed with security in mind. And in this growing Internet of Things world, just about every device imaginable can create a potential vulnerability. This creates something of a double-edged sword, say security experts. On the one hand, it distributes risk and the consequences of a successful breach. But it also creates a broader “attack surface” with more vulnerabilities and opportunities for attackers to gain access. “Modern grid technologies expose existing security vulnerabilities in new ways, as well as introduce new benefits,” Advanced Energy Economy Institute concluded in an assessment of cybersecurity challenges on a distributed grid, published earlier this year. Thus far, the utility sector in this country has dodged any major disruptions due to cyberattacks. There have been minor intrusions, malware infections and false alarms, but so far, hackers have not been able to turn off the lights. Increasingly, however, security experts concede a successful attack is likely to happen eventually. “In theory, a grid with more distributed resources can increase the potential attack surface for adversaries because the capacity of distributed generation, including renewables, has grown exponentially over the last decade,” Bill Lawrence, director of NERC’s Electricity Information Sharing and Analysis Center, told Utility Dive in an email. Some of the success in deflecting attacks so far, said Lawrence, is because many of the new distributed resources are including cybersecurity concerns and plans from the start of a project, and up-to-date security solutions are coming to market. Some of those security products, he said, have been developed through the Department of Energy’s Cybersecurity for Energy Delivery Systems research and development program. DOE’s Office of Electricity developed the R&D program, aiming to help energy sector asset owners. The Office of Electricity’s website neatly presents some of the difficulties presented by distributed resources. COLUMBUS — Ohio utilities would still have to find more of their power from renewable sources like solar and wind but not as much as required by current law under a bill that could soon see a Senate vote. “The governor vetoed the concept [of killing the renewable-energy mandates] in the past,” said Sen. Bill Beagle (R., Tipp City), who offered the compromise amendment adopted by the Senate Energy and Natural Resources Committee. With overwhelming bipartisan support, Ohio lawmakers in 2008 mandated that FirstEnergy, American Electric Power, and other utilities find 12.5 percent of their power from wind, solar, hydroelectric, and other renewable sources by 2025. But by 2014 lawmakers’ resolve had weakened amid arguments by the utilities that the effort was about to start affecting customers’ bills. They passed a law to take a two-year timeout, freezing in place the annual incremental benchmarks that the utilities had to meet on their way to 12.5 percent. Gov. John Kasich went along with the two-year freeze, but he vetoed a follow-up measure in 2016 to extend that freeze indefinitely. The march toward 12.5 percent resumed, but is now two years behind schedule. While preserving the idea of requiring measurable progress on purchasing renewable power, Mr. Beagle’s amendment sets the new final mandate at 8.5 percent by 2022 instead of 12.5 percent by 2027. In addition, the new mandated carve-out for solar power within that broader renewable mandate would be reduced to 0.34 percent from 0.5 percent under current law. The revised bill would also mandate that the utilities reduce electricity use by 17.2 percent, down from 22.2 percent, by 2027. House Bill 114, as sponsored by Rep. Lou Blessing III (R., Cincinnati) and passed by the House, did not talk about siting wind turbines. But it’s been a contentious issue since 2014 when lawmakers enacted new property setback restrictions that the wind industry contends have all but brought wind farm investment to a standstill. “We need to rethink that and come up with something — not what the old setbacks were but something that would permit an industry to succeed,” Mr. Beagle said. The Senate could vote on a revised bill before it recesses for the summer within the next two to three weeks. Current law prohibits the placement of a wind turbine if the tip of its closest extended blade would come within 1,125 feet of a property line. The amendment would change that to 1,125 feet from the nearest habitable residence for wind farms generating at least five megawatts of power. The amendment also provides for a setback from the nearest property line of 1.2 times the tower’s height, up from 1.1. This further ensures that if the tower were to fall, it would not encroach on a neighbor’s property. Some wind farms have faced opposition from owners of neighboring rural properties who object to the noise, light reflection, and shadows from the turbines. The towers’ placement within closer proximity can reduce the current and future use and value of their land without compensation, they’ve argued. Sen. Robert McColley (R., Napoleon) voted for House Bill 114 and its repeal of the green power mandate while still in the House last year. He said he still agrees the free market works better than government intervention. But he could vote for the new version if the wind farm changes include his proposal giving counties and townships greater authority in considering wind farm projects and giving voters the opportunity to second guess those decisions at the ballot box. Representing a district where wind farm development and property rights have clashed, he said he’d like to see a compromise. He said he recognizes the current rules have stymied wind farm development. The Ohio Environmental Council likes the wind farm setback language but isn’t pleased with the reduced renewable and energy efficiency mandates compared to current law. Despite fears that changes in the tax code would slow wind power development, the tax equity market, the key financing vehicle for wind projects, appears to have adapted and survived intact. The number of wind power purchase agreements (PPA) signed last quarter was the highest volume of PPA announcements in any quarter since AWEA began tracking them in 2013. AWEA noted that six companies, including Adobe, AT&T and Nestle, signed wind PPAs for the first time while several other corporations were repeat customers. Utilities also stepped up to the plate, with PacifiCorp announcing plans for a $2 billion wind farm in Wyoming. In March, DTE Energy submitted a proposal to regulators for 1,000 MW of wind farms that would be completed by 2022. The two main factors contributing to the increase in projects are the greater certainty around tax policy and the fact that developers are eager to meet the deadlines imposed by the Congressionally mandated phase out of the production tax credit (PTC), Keith Martin, a partner at Norton Rose Fulbright, told Utility Dive. The PTC, which provides an incentive payout for the first 10 years of a wind farm’s life, has been a driving force in the growth of wind power, as has the financial structures that have allowed financial institutions to monetize the value of tax credits. Those structures have expanded the market beyond the relatively few entities that are in a position to make use of the tax credits. In the run up to the passage of the Republican tax bill last year, there were concerns in the wind power industry that a last minute provision in the tax bill, the Base Erosion Anti-Abuse Tax (BEAT), could have a “devastating” effect on renewable energy projects. The BEAT provision was designed to make it harder for corporations to dodge taxes, but it would also sweep up tax credits — such as the PTC for wind power and the Investment Tax Credit (ITC) for solar projects — making the credits more difficult to monetize. But the BEAT concern has gone away for two reasons, Martin said. The industry worked hard to mitigate the provision as it was enacted and succeeded; it doesn’t really have its full effect until after 2025, he said. Second, the biggest players in the tax equity market realized that they are not really affected by the provision. “They have the planning tools,” Martin said. The BEAT provision aims to close a loophole for certain kinds of cross-border transactions, but by changing the name of a payment, you can make it go away. The top three players in the tax equity market account for 40% of the market and they are not affected, he said. With the BEAT issues behind them, bankers and developers have returned their focus on beating the clock for the phase-out of the PTC. Even though the value of the PTC is cut by 20% for 2018 projects, under Internal Revenue Service rules, projects that had already begun work on equipment or at a project site in 2016 are still eligible to collect 100% of the PTC. That prompted a lot of developers to buy and stockpile wind turbines. Based on stockpiled equipment from 2016 there are about 40,000 MW of wind projects in the wings with another 10,000 MW of equipment stockpiled in 2017. As the clock continues to count down on the PTC, which ends after 2019, “there will be a rush in 2020 to get everything finished,” Martin said. Utilities are welcoming a historic rooftop solar building code in California, but urging caution with its implementation in order to protect non-solar customers. At the same time, utilities and solar developers are calling for a dialogue among stakeholders to effectively integrate additional rooftop solar into the grid. The California Energy Commission approved the 2019 Building Energy Code May 9, requiring renewable energy access for all new residential homes in the state starting in 2020. The standard is important for the state’s ambitious climate and renewable energy goals. The largest investor-owned utilities (IOUs) in the state have supported solar energy growth, with each pursuing initiatives to reduce the state’s greenhouse gas emissions. Among those utilities, Pacific Gas & Electric and Southern California Edison (SCE), support the rooftop solar mandate, company spokespersons told Utility Dive. CEC’s mandate could require between 68 and 241 MW of annual distributed solar buildout, according to ClearView Energy Partners’ research using 2017 data. While IOUs in California have established processes to accommodate new solar interconnections, the future buildout from the mandate will require more planning. “Moving forward, we’ll need to place a greater emphasis on the planning process and how we incorporate more concentrated areas of solar, like in a tract of homes, into the grid,” Jill Anderson, vice president at SCE, said in an email to Utility Dive. Anderson noted that SCE is ready for that planning process. ClearView analysts have singled out the distributed solar mandate as a possible opening for utilities to argue that California should reconsider the state’s net metering redesign. “At this point, the new mandate should not impact any of our rate design considerations,” wrote Terrie Prosper, spokersperson for the California Public Utilities Commission (CPUC), in an email to Utility Dive. “While we support rooftop solar, we also strongly support a system that balances the needs and interests of all customers,” Joe Britton, communications manager for San Diego Gas & Electric, said in an email to Utility Dive. New analysis from Moody’s Investor Services rated the new standards as credit negative for the state’s utilities, but positive for securitization deals backed by solar leases and power purchase agreements (PPAs). Specifically, Moody’s said the utilities’ fixed costs, from transmission and distribution, will be shifted to customers who do not self-generate power. “If the new mandate increases grid operational costs, we will need to determine how to fairly allocate those costs as more facts develop on cost to the grid impacts,” Prosper wrote. “We expect that utilities will rely on regulators to monitor the credit customers receive through net energy metering and continue to modify that policy to help utilities navigate the energy shift,” Moody’s analysis said. Residential solar developers want utilities to view distributed solar power as a cost-saver to the grid. The state’s grid operator approved a new plan in March to save $2.6 billion in future transmission costs by utilizing rooftop solar and energy efficiency resources. “Solar and batteries on homes and businesses are already saving all ratepayers money by avoiding the need to build fossil fuel power plants and expensive transmission and distribution infrastructure,” Alex McDonough, public policy vice president at the residential solar developer Sunrun, said in an email to Utility Dive. Dialogue may be the best way forward for rooftop developers and utilities to integrate incoming rooftop solar as seamlessly as possible into the grid. SDG&E encourages policymakers to engage stakeholders “in a dialogue to begin the process of finding a more balanced way for solar customers to interact with the grid that protects against negative unintended consequences,” such as shifting grid costs to non-solar consumers, according to Britton. “If utilities are already raising concerns about (the 2020 residential solar mandate), I say let’s get together and let’s hear from them, and let them show us where do they think that it’s going to be a challenge to the grid,” Anne Hoskins, former Maryland utilities commissioner and policy chief at Sunrun, told Utility Dive. Energy production from renewable sources continues to expand in the U.S. at a rapid clip, thanks in no small part to the substantial growth of solar energy—and distributed solar in particular—in recent years. More states than ever are making solar a priority. But where have these gains been greatest, and what are the economic implications for residents from one state to the next? New Jersey’s net metering law ensures that their residents will get “full retail credit” on their utility bill thanks to solar energy produced by their residential arrays. Lawmakers in the South Carolina House of Representatives last week voted to expand the states’s net metering program, passing an amendment to the state’s budget bill that would raise the cap from 2% to 4% of peak load. However, Greentech Media notes the measure still must be OK’d by a budget conference committee and then passed by the Senate. In Vermont, the solar industry is decrying a decision by regulators to lower the rates paid to residential systems — by some estimates, lowering the value of a rooftop system by $750, according to the Rutland Herald. Rooftop solar’s growth continues to spur debate in various states and last week Vermont and South Carolina appeared to head in different directions. There seemingly is support among lawmakers in the Palmetto State to double the net metering cap, while regulators to the north cut the rates paid to many systems. 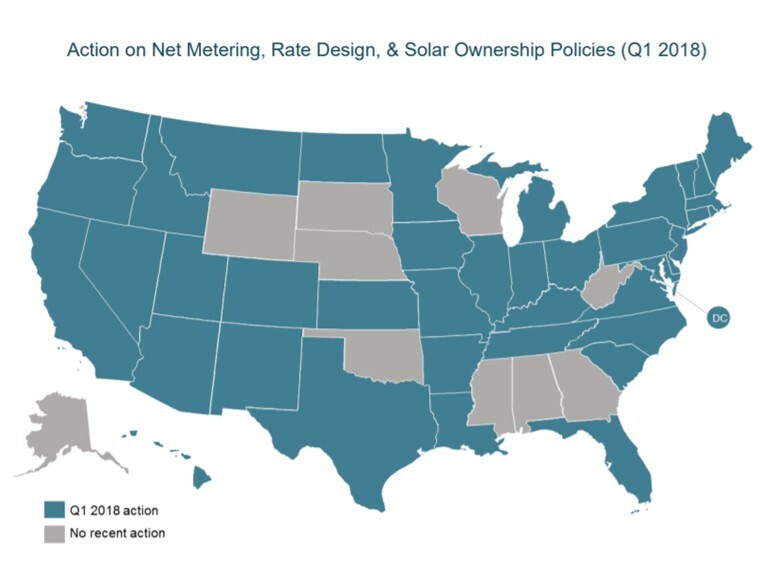 Many states have adopted successor tariffs to net metering, includingIndiana, Maine, New Hampshire, New York, Utah, Hawaii, Nevada, California, Vermont and Arizona. In South Carolina, lawmakers voted last month to raise the cap on the state’s residential solar market, but the measure did not pass due to procedural wrangling. The state’s willingness to grow rooftop solar may be areaction to failed nuclear development. SCANA Corp. spent billions before pulling the plug on its VC Summer nuclear project, and lawmakers have been working to limit its subsidiary South Carolina Electric & Gas from recovering nuclear costs from customers. Solar has transformed into solar-plus-storage; What will net metering become? New rate designs to replace solar’s foundational policy leave solar-only behind When distributed solar becomes more of a stress than a service to the grid, it transforms into solar-plus-storage and begins again the struggle to build economies of scale to drive its price down to levels competitive with traditional generation. That transformation happens when distributed solar penetration levels approach the point where the system can no longer benefit from new daytime generation. That happened in Hawaii. Growth trends show that penetration level is coming in California, Arizona and Massachusetts. Net energy metering (NEM), the policy that solar has long relied on to drive its growth, was no longer tenable in Hawaii. It is facing the same circumstances and the same fate in California, Arizona and Massachusetts. But NEM, too, is being transformed. Policymakers are trying new rate designs intended to drive solar-plus-storage growth the way NEM drove solar. The Center for Energy Efficiency and Renewable Technologies (CEERT) was among the renewables groups that pushed for California’s original renewables mandate and for its trend-setting increases. But California now has large deployments of renewable and distributed resources and its goal of “just building MWs” must change to be of service to the grid and help meet the state’s climate goals, Executive Director V. John White told Utility Dive. New numbers from the North Carolina Clean Energy Technology Center (NCCETC) Q1 2018 50 States of Solar show solar policy debates are accelerating. There were 149 legislative and regulatory actions on solar last quarter, up from 134 in Q1 2017. NCCETC’s annual update cataloged 249 actions in 2017, up from 212 actions in 2016.
growth trajectories, policymakers are designing rates and incentives for solar-plus-storage. And they aredesigning them with a precision intended to protect solar-plus-storage from a future of never-ending battles between solar advocates and utilities and their allies over cost shifts and caps. The new NCCETC report shows Q1’s 149 policy actions were in D.C. and 40 states. Many were familiar utility responses to changes or anticipated revenue losses from flattening load. The 59 utility requests to increase monthly fixed charges or minimum bills on all residential solar customers are in that category. “More and more states are doing value of DER studies and looking at new rate designs for customers with solar, energy storage, electric vehicles and other DER,” Proudlove told Utility Dive. Two prominent policy action actions last quarter involved rate designs that could similarly work against solar-only but drive a more innovative use of solar-plus-storage, Proudlove said. The less controversial one was time-of-use (TOU) rates. The very controversial one was three-part rates withdemand charges. California is scheduled to fully implement mandatory TOU rates for all customers by 2019. In the last few months, the state’s investor-owned utilities have been moving their peak charge periods to later in the evening. Southern California Edison’s peak period is now 4pm to 9pm. “It creates a small incentive to face rooftop solar west, to maximize production from the setting sun, but it mainly rewards customers with solar-plus-storage systems,” Proudlove said. Xcel Energy Minnesota proposed an opt-out TOU rate pilot in December designed by Strategen Consulting Senior Director Lon Huber. His intent was a rate “scalable into a high renewable energy future,” he told Utility Dive at the time. “The on-peak price lets customers know when the system is most overloaded and signals them to reduce their use,” Huber said. The 5-hour peak window was designed to suit customer behaviors. It also directs those with battery storage or EVs to charge with renewables-generated electricity during the low-priced super off-peak period and use it during on-peak hours, he added. Massachusetts regulators made history in January by approving Eversource Energy’s three-part rate design. It includes a mandatory demand charge for DER-owning residential customers, and is thought to be the first rate design of this type to be approved for a regulated electric utility. A demand charge, which is common for commercial-industrial customers, imposes a significantly higher per-kWh charge for the kWh used during a customer’s highest 15 minutes of electricity consumption each month. For some commercial-industrial customers, that single charge can be as much as a third to half of their monthly bill. Eversource opponents say the demand charge will compromise Massachusetts’ rooftop solar value proposition and significantly disrupt2017’s fifth biggest U.S. residential solar market. Strategen Consulting’s Huber explained why. The Tesla-SolarCity settlement with Arizona public power utility Salt River Project (SRP) illustrated Proudlove’s point. “SRP will not be the last of the 3,000 U.S. utilities to impose a residential rate structure that benefits solar-plus-storage,” Manghani prophetically told Utility Dive at the time. “Any kind of net energy metering reform that reduces the value of solar works in favor of storage.” His insight was that if a policy reduces the value of solar-only, it encourages customers to add storage to offset as much of their own consumption as possible. Because solar’s value declines as its penetration grows, “tariffs should evolve over time,” Burger said. “Moving from today’s volumetric rates to more cost-reflective rates will likely naturally slow the deployment of rooftop solar.” This is not an attack on solar but a more accurate valuation of it. CEERT’s White said the solar industry must understand that rate and incentive designs can no longer be only about adding more solar. “The premise that every kWh of solar that we add will reduce greenhouse gas emissions is just incorrect,” he said. Howard Solar Farm Alternative (HSFA): :Office of the Provost Associate Provost for Research and Graduate Studies Gary L. Harris, Ph.D., P.E. generated to 3rd party (alumni). be converted into thermal and/or electrical energy. times the world’s total energy consumption. creates the bio-mass that makes fossil fuels. were first invented at Bell Laboratories in 1954.
billion miles around the earth. surrounding a body) at a temperature 5800 ºK. protected us from some of the harmful radiation. amounts of the Sun’s total output power. How do Photovoltaics Cells Work? release negative charge particles (electrons). illustrated in the diagram shown above. spectrum of light to electricity. tunnel junction cells (also called tandem cells). (Washington, D.C.) Today, the Public Service Commission of the District of Columbia (Commission) ordered Washington Gas Light Company (WGL) to disburse $522,189 in unclaimed funds to the Washington Area Fuel Fund (WAFF) and the Greater Washington Urban League (Urban League). The funds will be used to benefit low-income residential heating customers during the winter heating season. In 2014 commission opened an investigation into allegations that WGL made $2.4 million dollars in unauthorized payments to Competitive Service Providers that over-delivered natural gas supplies. Due to the over-collection of payments from District ratepayers, WGL issued refunds to 33,590 inactive customers totaling $452,924, and bill credits in the amount of $1,457,579 to 73,268 current customer accounts. However, WGL reported that a total of $522,189 remained unclaimed. This prompted WGL and Office of the People’s Counsel (OPC) to recommend to the Commission to donate the unclaimed funds equally between WAFF and the Urban League in the amount of $261,094.50 each. As a condition for receiving the disbursement of the funds, the WAFF and the Urban League must submit an annual statement with WGL indicating the number of low-income natural gas customers’ who received the funds in DC, and the average amount each customer received. The Order directs WGL to disburse the funds within 15 days of the Order and to file a Final Disbursement Report confirming disbursement. For additional information, visit the Commission’s website at dcpsc.org. Follow the Commission on Facebook and Twitter at “DCPSC”. Uses nonviolent, direct action to demand that PECO, Pennsylvania’s largest utility company, make a major shift to locally generated solar power that benefits low income communities and communities of color. Our campaign brings together EQAT and POWER, a broad multi-faith network of 60 congregations, to address three critical issues: underemployment, crumbling infrastructure, and climate change. Dramatically increase the purchase of local rooftop solar power so that 20% of PECO’s electricity comes from roofs in its service area by 2025. To meet the minimum of state law, PECO only gets a fraction of 1% of its energy from solar — and much of that from out of state. When we first met with PECO executives, the company insisted that increasing local solar was impossible. So after months of demonstrations, we issued an ultimatum: Purchase that fraction of a percent from North Philly by May 2016, or face escalated nonviolent direct action. Property Assessed Clean Energy (PACE) is a tool that helps commercial property owners access affordable upfront financing for solar PV and other energy measures, putting solar within reach of many customers. PACE is now available to commercial, multifamily, non-profit, and industrial building owners in the District, most Maryland counties, and Arlington County in Virginia. More Virginia and Maryland counties are expected to launch PACE this year. Join MDV-SEIA, the regional solar industry association, and the Mid-Atlantic PACE Alliance to learn about how PACE works and how it can help you get more deals done across the DMV.